Abby Freeman of Delta draws contact during Friday’s game at Swanton. The Panthers opened the season with a 45-17 win over the Bulldogs. Ashlynn Waddell stops under the basket en route to converting a three-point play for Swanton. Braelyn Wymer of Delta drives to the basket as Averie Lutz of Swanton defends. 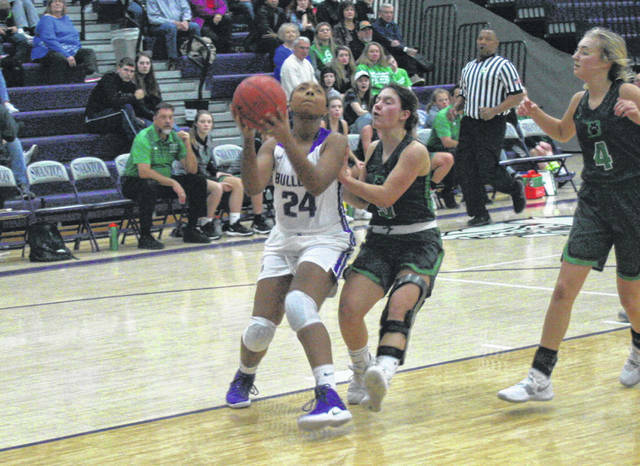 On a sluggish night offensively for both teams, Delta outscored Swanton 21-3 in the second half in a 45-17 non-league win on the opening night of the girls basketball season Friday. The run came after Swanton, down as many as 17 in the second quarter, cut it to 10 at the half. 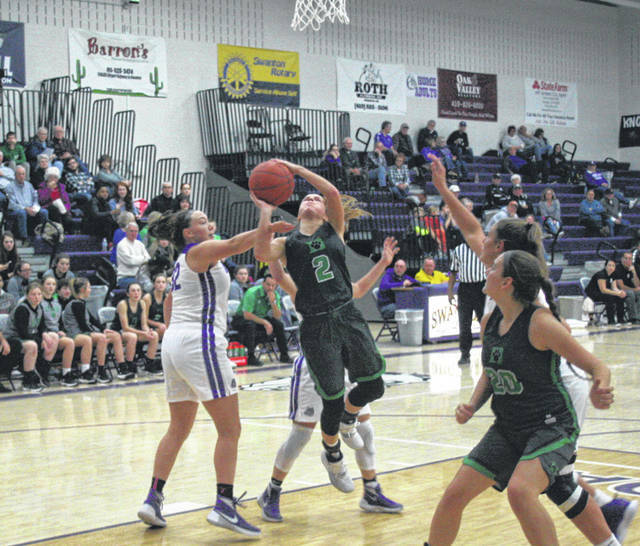 There was a total of one field goal between the Panthers and Bulldogs in the third quarter, but Abby Freeman was 2 of 6 from the free throw line for Delta and Averie Lutz knocked down a pair for Swanton. The three-pointer came off the hand of Panther sophomore Braelyn Wymer, who drilled one from the top of the key in the waning moments to make the difference 30-16 after three quarters. The Panthers got a fastbreak bucket from Freeman, plus a pair of free throws each from her and Alayna Mitchell, extending the lead to 20 at 2:29 into the final stanza. 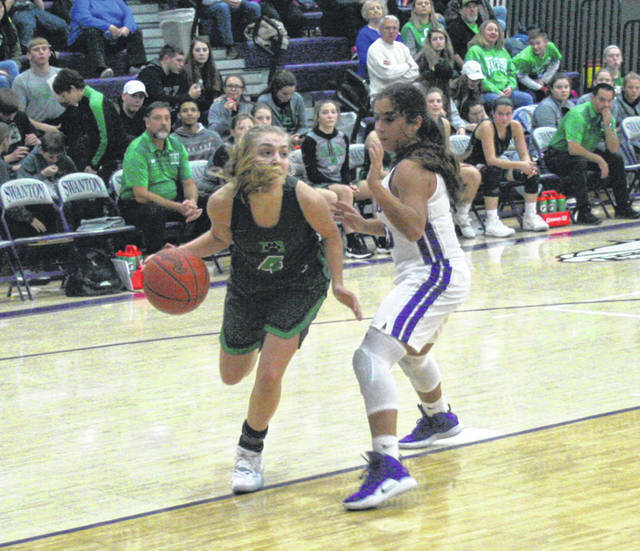 Brooklyn Green then hit a three from the corner for the Panthers, while Averie Lutz split a pair of free throws with 4:47 to go for the final Bulldog point. A putback basket by Freeman after she missed two from the charity stripe, 1 of 2 from the line for Braelyn Wymer, and a three-point play from Brooklyn Wymer closed out the scoring. Four different players scored for Delta in the opening quarter as they built a 16-6 lead. Getting on the board for Swanton were Grace Oakes, Averie Lutz, and Kara Truckor. Delta then got out to its biggest lead of the opening half, 23-6, after a Green basket inside, a three-point play by Freeman, and Reagan Rouleau’s jumper to begin the second period. However, the Dogs would score 8 of the game’s next 9 points to end the half. Jessica Dohm buried a jump shot, Ashlynn Waddell converted a three-point play, and Truckor added a triple around 1 of 2 at the line by Green. Swanton next hosts Lake Tuesday, while Delta has its home opener against Pettisville the same night.